kyhtnos: the one to fall in love with! Kythnos has landscapes that will stun you, colours and scents of the Aegean, stories that sweetly mix legend and myth with history, all proving that majesty is often found in simplicity, and all this just a breath away from Athens! Once you get to know Kythnos, you will realise why its name is derived from the ancient Greek verb “keftho”, which means “hide”. 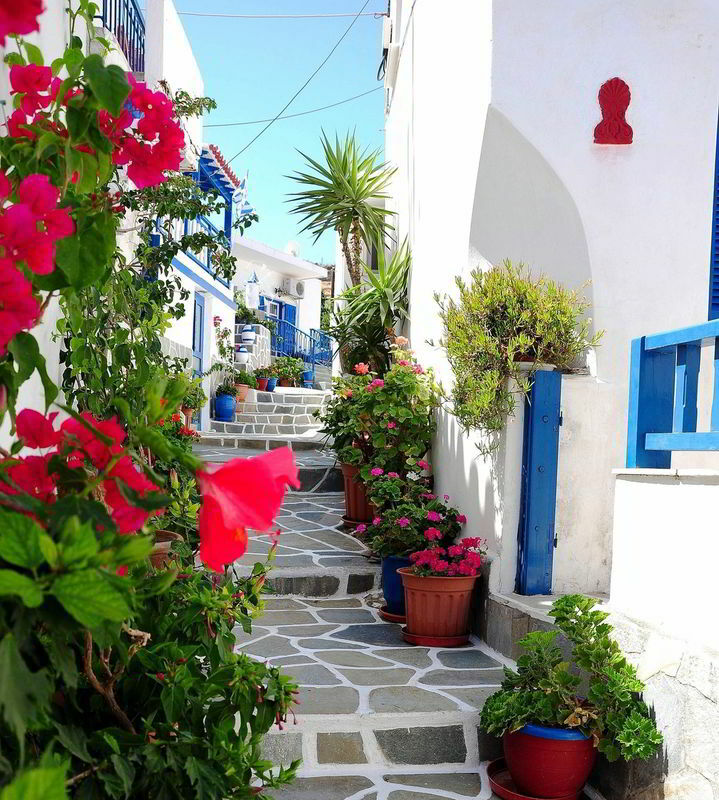 So much “hidden” beauty and authentic Aegean character, and just a short hop by ferry, really close to Athens. With a long history starting in the mists of the Mesolithic period, Kythnos, modest and hospitable, unexpectedly beautiful and serene, welcomes you. And then there are the aromas of oregano and thyme, windmills put to task by the Aegean winds and lonely lighthouses whose light imparts a sense of safety and hope. This is Kythnos, a living fairy tale inviting you to experience it together with its hospitable open-hearted residents, an island ready to be fallen in love with. Being so close to Athens makes it an ideal city break destination, but trust us you'll need a week to fully discover the beauties of this island. Hora, otherwise known as Messaria, is the capital of the island built on a hilly ridge along which the houses unfold. Walk along the maze- like paved footpaths, under ornate arches and flanked by whitewashed houses, all closely huddled together. Around every corner you will see paintings by local residents depicting many aspects of island life; you will feel the calm pace of everyday life among churches, windmills, fountains and small squares. The area on the northeast side of the island is well known for its thermal springs, frequented by King Otto and Queen Amalia back in the 19th century. Today there is a thriving hydrotherapy centre with organized facilities. The subterranean waters, rich in salts, sulphur and iron, offer sensuous warm bathing and therapeutic properties for many ailments. Enjoy every second! 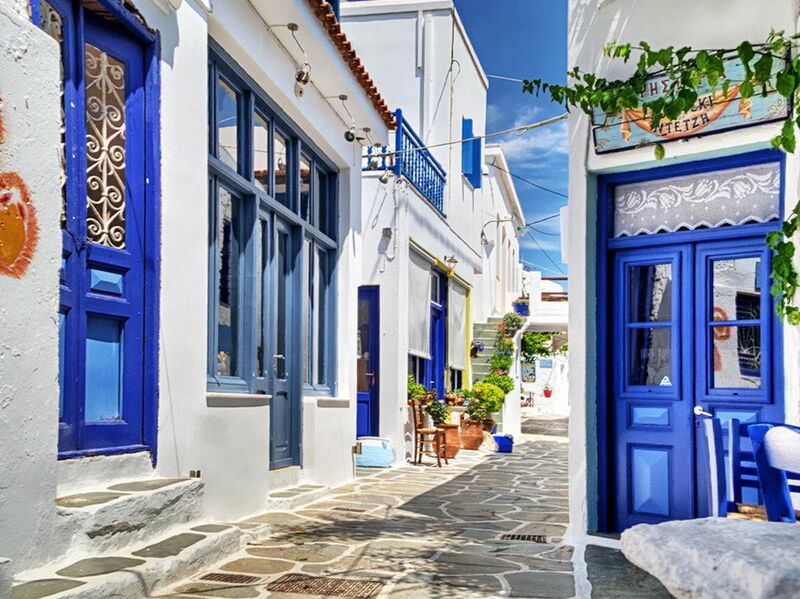 Quiet, far from the sea and its winds, this little hamlet lends itself to leisurely strolls in its alleyways. You will be impressed by the originality of the houses, all of which have tiled roofs, probably remnants of the village’s tradition in ceramics. In Piazza, the only square of the hamlet, you will enjoy a coffee and while ascending to the neighborhoods of Galatas and Pera Rouga you will admire beautiful churches. When nature is in the right mood, the results are places like Kolona beach. A narrow strip of heavenly sand is surrounded by the sea creating two independent beaches. The deep blue, limpid waters and the uniqueness of the landscape justify its description as one of the most beautiful beaches in the Aegean. In the only area on the island with pine trees, perched on a rock, lies the monastery of Panagia Kanala, named after the patron saint of the island and one of the most important pilgrimage sites in the Cyclades. The miraculous icon of the Holy Virgin, allegedly a creation of Saint Luke, is kept here. Tradition has it that the icon was found by fishermen on a starry night in the straights between Kythnos and Serifos. On August 15th every year, there is a big celebration with a procession and re-enactment of the discovery of the Blessed Virgin’s icon. Only 800 m away from Hora, lies the monastery, whose main church still stands resplendent in its island style, with curved and white washed dry stone walls. Legend tells that it was to here that the icon of Panagia Nikopios was transported from Constantinople, later stolen by the Venetians and today situated in Saint Mark’s in Venice. On August 15th every year, there is a big celebration followed by a great feast. On the Katakefalos elevation, where the capital of the island used to be, there are remnants of houses and two churches of the citadel that prospered during the Venetian occupation. It is thought to be the legendary castle of Oria which withstood the Turkish siege for 12 years and fell because of a traitor who seduced beautiful Oria into opening the gates for him. Live the myth while gazing at the sea. The view of the Aegean is unique. The folk museum in Driopida is well worth a visit for the local costumes and objects of everyday use from days gone by exhibited there. Through them you will get a special insight into the locals’ way of life. Visit the church of Agios Minas in Driopida with the best carved wood altarpiece, the traditional hand-crafted bishop’s throne and ornate Holy Bier. In Hora, you should visit the church of Agios Savvas dating from 1613 and the church of Metamorfosis tou Sotira with its special screen, the work of some of the greatest Cretan icon painters. The wonderfull paths of Kythnos give the travelers the chance to discover the mountainous landscapes of the hinterland, the stone walls and the deep blue of the Aegean from the beautiful cells and stockyards, the most beautiful observatories of the Aegean. Thee open air museum on the beach of Apokrousi, the purple color of the mountains from thyme, sage, fireflies, and lizards will make you remember your own sound of steps within the hidden abudance of the inland of this island for ever. 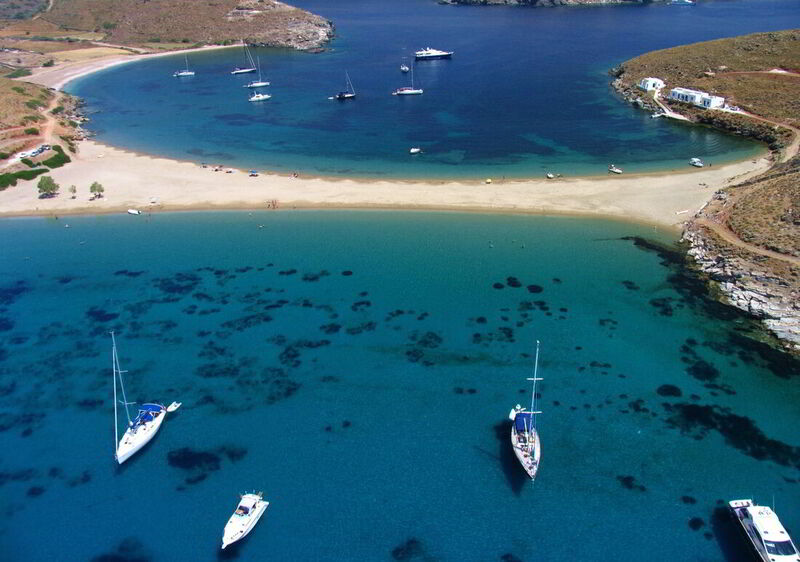 Kolona beach is the most famous and perhaps the most beautiful beach on the island of Kythnos. You can admire the skillfully crafted bishop's throne, the wood carved iconostasis and the masterfully embroidered Epitaphios cloth in Agios Minas. You should pay a visit to the church of Agios Savas that was built in 1613. It bears the coat of arms of the Gozzadini family, i.e. a family of Venetian feudal lords. The church of the Transfiguration of Jesus, whose iconostasis was created by the famed Cretan Skordilis family of icon painters in the 17th century, is also worth visiting. So is the single-naved basilica of Agia Triada, which is the oldest church in Chora. A fenced outdoor space, where a Christian church used to stand, now contains archaeological findings from various excavations on the island.